During the 1980s, Ray Berger and Eric Oszustowicz would often embark on photographic expeditions. 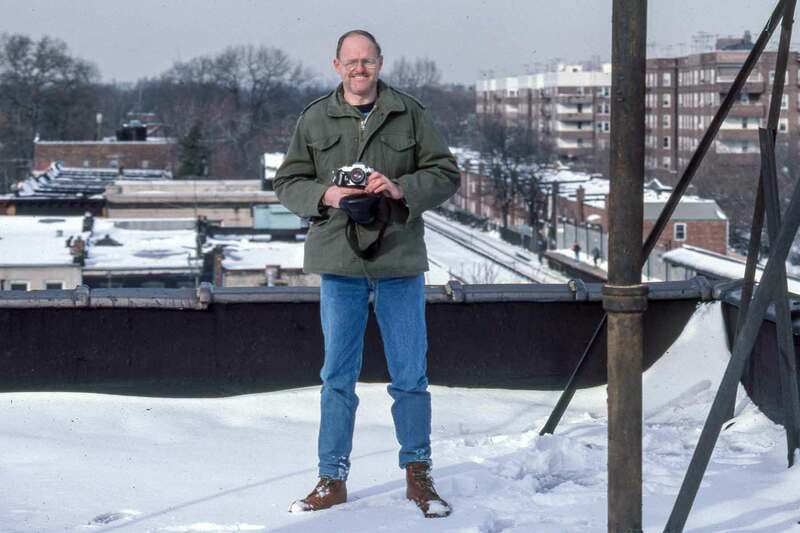 On January 9, 1988 they convinced a property owner along the Brighton Line to allow access to his roof to obtain a bird’s eye view of the then-new R68s. Ray grew up in the Bronx. 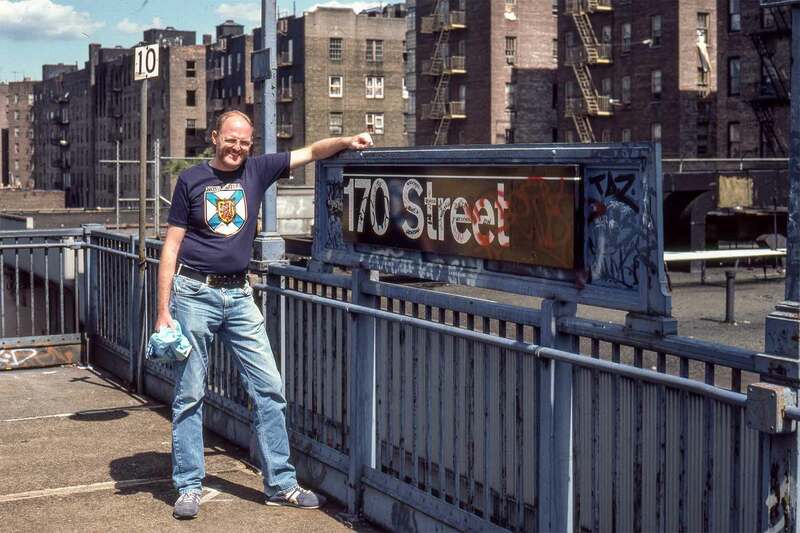 Here he is at the 170th Street station of the #4 line to photograph the then-new R62s on September 1, 1984. Ray also extensively photographed commuter railroads. He is pictured here at the Port Jefferson station of the LIRR on June 3, 1984. 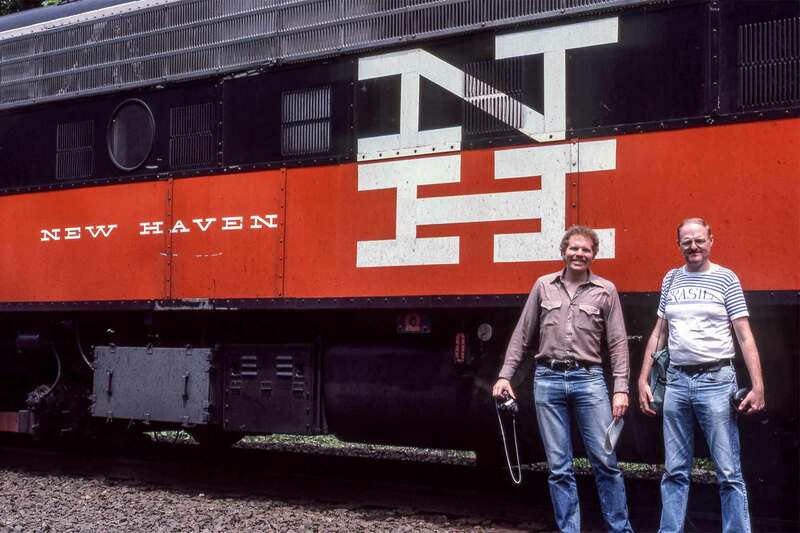 Glenn Smith (on the left) and Ray standing beside a Metro-North FL-9 locomotive during a fantrip along the Maybrook Line on May 23, 1987. Both served together on the board of the NY Division of the ERA. 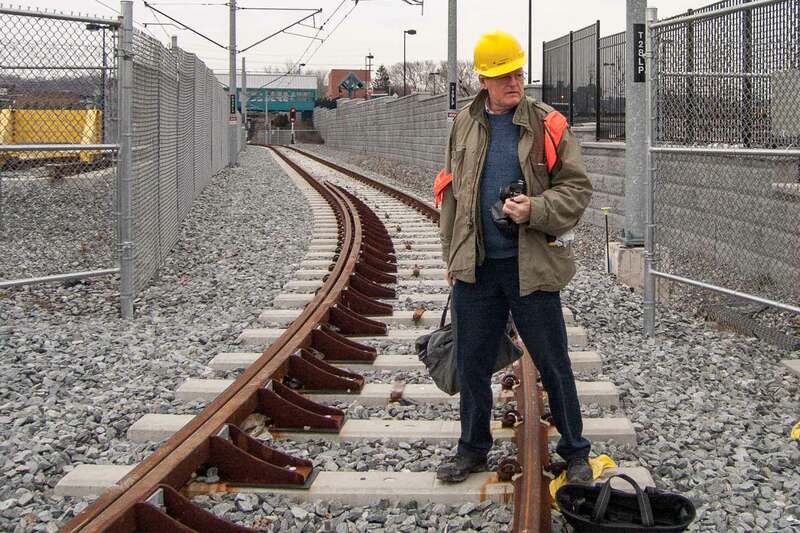 Ray inspecting the Tonnelle Ave. loop during a 2006 ERA tour along the soon-to-open Bergenline Avenue extension of the Hudson-Bergen light rail line. Like clockwork, Ray would be the presenter for almost every October meeting of the ERA. His final slideshow, a fascinating tour of the six electric railway networks of France, was in 2015. On March 1, 2016, Raymond R. Berger passed away at the age 74. Ray had been an ERA member since 1958. He served as second vice president and corresponding secretary on the ERA’s board of directors for many years and also served for a time as the chairman of the NY Division. He will be missed by us all. To state that Ray performed work for the ERA is quite an understatement. All who perform work for the ERA do so on a strictly volunteer basis. Ray was an extremely busy individual with many interests, but he was always available to do work for the organization. Much of his work was in a leadership role, but Ray never had an issue with rolling up his sleeves in order to stuff envelopes, lug boxes or perform any other required tedious task. In an era when time is a precious commodity, he was always selfless and ready to sacrifice his time for the betterment of the ERA, a sacrifice for which he never sought adulation. The greatest legacy that he leaves for all of us is the part he played in maintaining the ERA as a strong and purposeful organization. Ray was a busy man indeed. He travelled the world. Ray photographed almost every transit system in the western world (and beyond) which included every system in Germany. In these travels, he met other transit professionals and enthusiasts with whom he corresponded regularly. In addition, the photographic results of his travels were shared through countless presentations at which he would educate attendees through meticulous narration regarding the transit systems displayed. Ray was a retired transit professional and was a respected member of NYC Transit’s Division of Car Equipment. Think of Ray the next time you ride an R-142 or R-142A since he con-tributed to their basic design. Ray was also a religious man. He attained secular membership in the Third Order of St. Francis and regularly volunteered his services at the St. Francis of Assisi Church in midtown Manhattan. When it came to any sort of work, Ray Berger was the consummate perfectionist, and he expected the same from others. Although he understood that perfection was impossible, he also believed that one should make every effort to attain it. His tenacity was legendary. 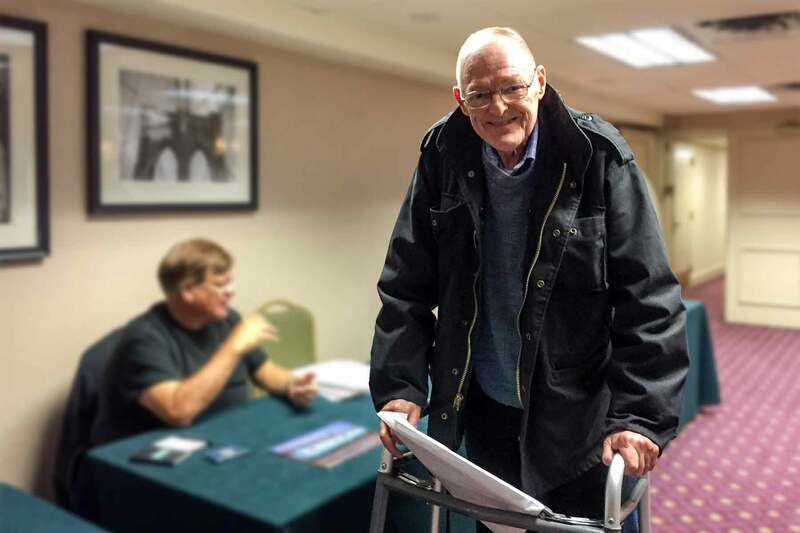 Even after a debilitating accident left him barely able to walk, he still travelled widely. 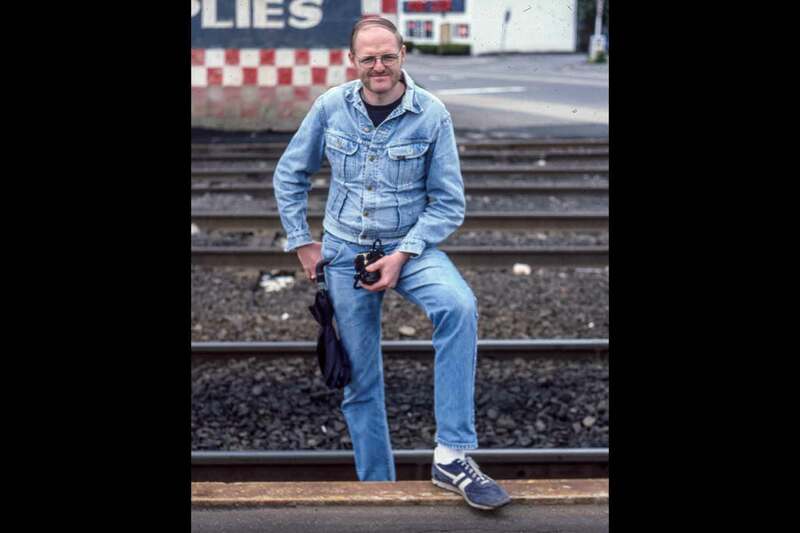 In fact, he passed away while doing what he loved, travelling to photograph transit systems on a cross-country journey. To the very end, he never gave in and never gave up. Let Ray be an inspiration to us all. To have known Ray Berger and been his friend was a grand and cherished privilege.